With 2016 drawing to a close, I'm grateful that it's been such a good year to be a GURPS fan. On our digital end, we introduced four new series – GURPS After the End, GURPS Disasters, GURPS Sorcery, and GURPS Steampunk – along with a steady stream of new GURPS supplements and Pyramid issues. But for a while now, customers and store owners had been asking us for more printed products, something they could hold and lend out. We listened, as we also grew in our knowledge of crowdfunding and printing options, until we felt that we could produce something that was both high-quality and profitable. 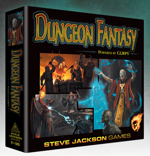 The big one was our successful Kickstarter campaign for the Dungeon Fantasy Roleplaying Game, a beautiful box set with dice, maps, cardboard miniatures, and just the rules needed for a classic dungeon crawl. We also printed two fun licensed books for traditional distribution: GURPS Mars Attacks and the stand-alone Discworld Roleplaying Game (Second Edition). And finally, we made three out-of-print books available via Amazon's CreateSpace: GURPS Magic, GURPS Thaumatology, and GURPS Ultra-Tech. With all of these options, I'm expecting many newcomers to GURPS over the next few years! If you'd like even more details, along with hints about upcoming releases, I updated the GURPS News page just before our winter break. Happy holidays!